Taking place January 2020 the MBA games is an academic competition that brings together 650+ MBA students from 20 Canadian institutions. Participants compete in disciplines such as technology, finance, strategy, and marketing; the academics are also complemented with sporting events. The upcoming games will be hosted by the DeGroote School of Business at McMaster University in Hamilton. The games offer competitors exceptional opportunities to represent Carleton on the national stage, build critical skills through real-life business simulations, and develop a community within the Canadian MBA ecosystem. This year’s captains are working voraciously to build on past success and achievements. Through coaching, recruitment, community, and fundraising initiatives the team is committed to achieving strong results with the long-term goal of establishing the MBA games program as a differentiator for Sprott MBA. 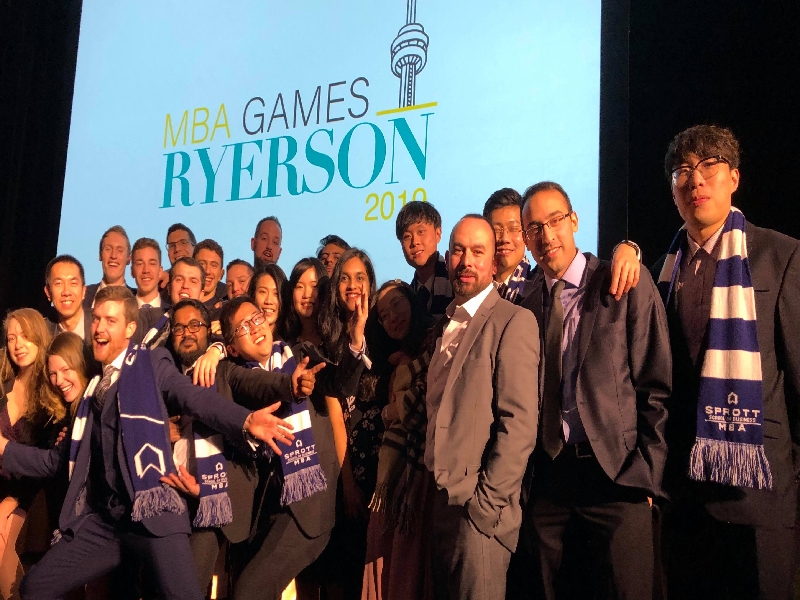 The 2019 MBA Games bore great results for the Carleton delegation. The marketing team secured a 1st overall finish due to out of the box thinking and exceptional strategic recommendations. Furthermore, all of the cohorts sports teams finished in the top tier of their divisions and moved forward to the final rounds. Overall, the team was strong across the board and finished above top ranking Canadian Universities such as McGill, UofM Asper School of Business, and the University of Calgary. Sprott is making an impact and will continue to do so in 2020. The 2020 Games are approaching in January however the hard work starts now. The captains are reaching out to local as well as global companies to establish partnerships, recruit coaches, and connect top competitors with recruitment efforts. The team will begin establishing leaders from the returning students and begin prepping their presentation skills over summer, these students will then be well equipped to lead the incoming cohort towards more victories for 2020. The organizing committee will also build a series of events and fundraisers for fall 2019 with the goal of building a positive buzz around the program and securing the final portion of funds needed to make the games possible. Any funds generated will be applied directly to the program and will ultimately allow Sprott to send a full delegation to the competition. The games have the potential to elevate the Carleton MBA program on a national level and give students the experience of a lifetime. A first overall win in 2020 would grant Sprott the opportunity to host the games in the inaugural year of the Nicol building with the impact of continuing to build the brand across the country, and the world. Students who compete learn invaluable things about themselves, and the business environment. This program will impact not only the school but also all the individuals putting in countless hours to make it happen. Thank you for your support!